They debuted in Fantastic Four #1 in November 1961, and have gone on to be iconic not only as a team, but as individuals. Reed 'Mister Fantastic' Richards, Sue 'Invisible Girl' Storm, Johnny 'Human Torch' Storm, and Ben 'The Thing' Grimm are all iconic heroes, who love and fight with each other as only families can - and they take down otherworldly bad guys like Dr. Doom and Galactus in the process. More than 50 years, thousands of comics, four animated and four feature films later, they remain one of the most enduring and exciting super-teams in pop culture. 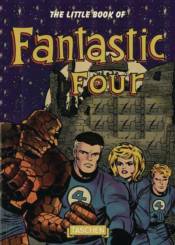 With 192 pages of images and text by Roy Thomas, The Little Book of Fantastic Four is your comprehensive guide to this famous foursome!